When I go grocery shopping and see the various President's Choice products (which often look great), somewhere in the back of my mind I wonder if it's actually any good. I'm not usually one to experiment much with PC brands, but when I do I'll post my discoveries here on my blog. 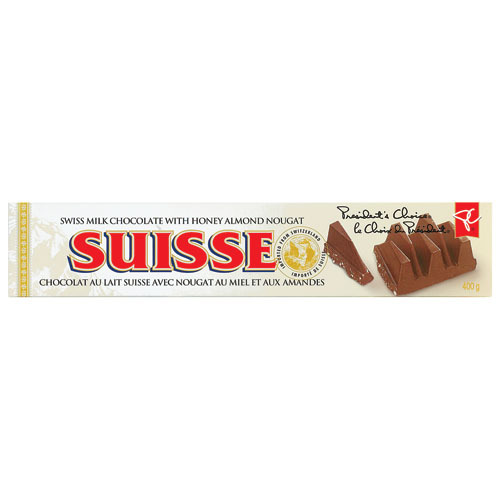 The one that comes to mind is the PC Suisse Swiss Milk Chocolate with Honey Almond Nougat. It'll probably remind you a lot of Toblerone chocloate bars...But, it's not nearly as expensive and I actually prefer the PC version as it's less "sticky" and doesn't get stuck on my teeth as Toblerone tends to do for me.